MadBum's Giants teammates Buster Posey and Hunter Pence also cracked the Top 10. 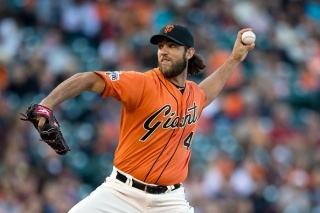 Still riding high after one of the greatest World Series pitching performances of all-time, San Francisco Giants ace and Series MVP Madison Bumgarner’s jersey is the most popular for fans around the globe. Bumgarner, 25, appears for the first time on the most popular player jersey list and leads a crop of charismatic and talented young All-Stars. The list, released jointly Friday by Major League Baseball and the Major League Baseball Players Association, also includes Buster Posey (#3) and Hunter Pence (#6). The list is based on sales of Majestic jerseys from MLB.com/shop, the official online shop of Major League Baseball, between Opening Day 2015 and the 2015 All-Star Game. Check out the rest of the Top 20 on CSN Bay Area.